The year of the bakery continues with some very delicious looking places that should be opening soon. Some new renovations are included in this season’s update including some activity on Hillsborough Street. This area primarily doesn’t see very many new shops and retail so perhaps this is the beginning of something. 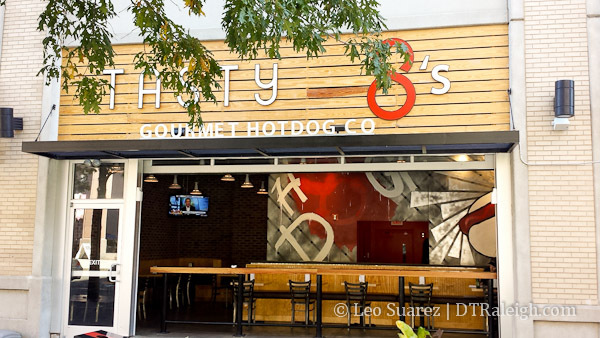 Tasty 8’s has opened on the 100 block of Fayetteville Street. (pictured above) They have really done a nice job with renovating the space and the gourmet hot dog menu looks, well, tasty! Across the street, Capital City Tavern has opened where Isaac Hunter’s Oak City Tavern used to be. We’re still waiting on the contemporary patisserie, Lucettegrace, to open, located at 235 South Salisbury Street. They are currently hiring so perhaps the opening is soon. 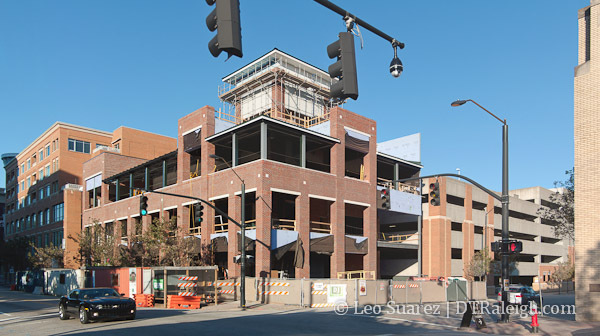 Ashley Christensen’s latest, Death & Taxes, is still undergoing work at the corner of Salisbury and Hargett Street. Posta Tuscan Grill, the restaurant in the Marriott Hotel, has closed and is being redone into Rye Bar & Southern Kitchen. The new restaurant concept should be open this winter. Seaboard Station has landed a coffee shop. Brew is open along Seaboard Avenue serving coffee, tea, and beer ever day. Seaboard Station is also getting a bakery. Night Kitchen Bakery and Cafe is currently hiring and you might run into them at nearby events. Check their Facebook. Taverna Agora is moving from their location in North Raleigh to Hillsborough Street. Their space next to Second Empire is currently being renovated and you can see steel rising above the building. Rooftop seating perhaps? Nearby, a beer bottle shop is coming to 401 Hillsborough Street. The shop hopes to open this winter. Standard Foods still has their sign up for a “late Fall” opening. In Glenwood South, Clouds Brewing has opened up on West Street in the former Napper Tandy’s space. Work continues on the Raleigh Beer Garden, a 100-tap beer garden located at 614 Glenwood Avenue. Follow their Facebook page for updates. The building at the corner of Glenwood Avenue and Tucker Street is finishing up and the Carolina Ale House, planned for the top floor, should open sometime before the end of the year. In the 510 Glenwood building, a Vietnamese noodle shop is planned for the former Oryx space. It will be called Pho Pho Pho Noodle Kitchen & Bar and you can see work actively taking place. Same building, Vincent Barresi, owner of Vincent’s in North Raleigh, is opening an Italian restaurant at the corner space where Myst used to be. The new place will be called Big Boom. Shuckers Oyster Bar and Grill has opened in the rear space of the building where Bogart’s (and more recently Cantina South) used to be. Eden Ultra Lounge has opened at 3 Glenwood Avenue where the former Dive Bar used to be. Another bottle shop and beer drinking locale has opened, located in the former Amra’s space, called The Stag’s Head. After Benelux Cafe moved out of their space in City Market, plans for a new coffee shop quickly came out. Expect City Market Cafe to open soon. In the Warehouse District, it looks like Spy Lounge has closed at 330 West Davie. In the works is a bar and arcade called The Boxcar Bar. If you don’t check them out, at least play some Pacman on their website. DAMN! A bar/arcade in Raleigh was MY idea!! Haha if only I had the $$…. just glad to hear we’re getting one! Looking forward to the bar arcade concept. Should attract Citrix workers looking for a happy hour spot. Capital City Tavern is basically a giant sweaty mosh pit of bros in their early 20s. Based on the renovations, I originally assumed it was geared more towards young professionals, but nope. Judging from the huge crowds, it seems the demand for bars outpaces the supply around Fayetteville St.
Great round-up, Leo! Thanks for posting this. The link for the Night Kitchen Bakery and Cafe website is incorrect. Their website is http://www.raleighnightkitchen.com. Sarah, thanks for catching that. I apologize for the mistake and it has been fixed.